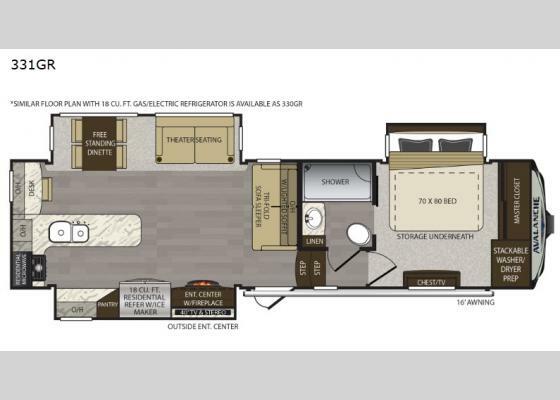 Imagine you and your spouse traveling full-time around the country in this Keystone Avalanche fifth wheel. You will enjoy sleeping each night in your own king-size bed and waking up to a refreshing breeze coming from the cross ventilation windows, and after showering in the 48" x 30" shower with seat, you will easily be able to pick out your favorite jeans and sweaters that have been stored away in the master closet. You will be able to cook up a fantastic dinner feast in the rear kitchen with a peninsula countertop, and when you've had too much of the great outdoors, you can relax for a while as you watch a movie on the exterior 40" TV or the interior 50" LED TV. With any Keystone Avalanche fifth wheel, you will enjoy getting to your favorite destination with the exceptional turning radius from the MAX TURN high-gloss fiberglass front and rear cap including the aerodynamic design for less drag, as well as the Road Armor suspension. 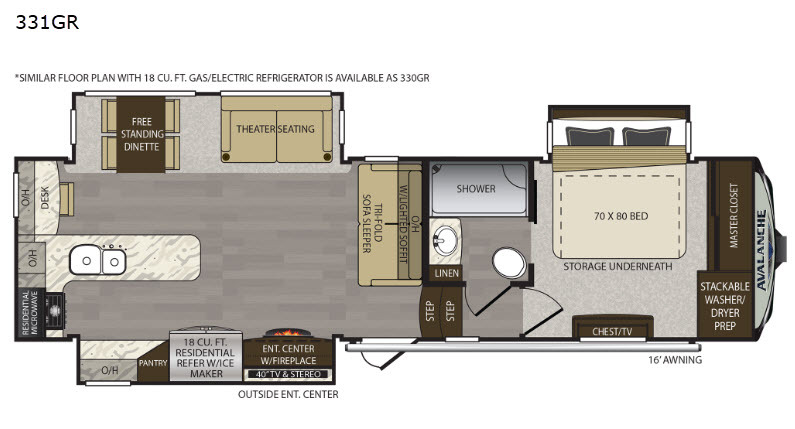 Once you have arrived at your destination, the One Place Command Center with its centrally located operational switches and gauges will allow you to set up your RV quickly, and the one-touch electric awning with adjustable arms will provide protection from the sun and weather while you load your clothing, dishes, and gear into all of the interior storage compartments.